Image caption A smuggling tunnel worker was among those killed by Israeli air strikes this week. 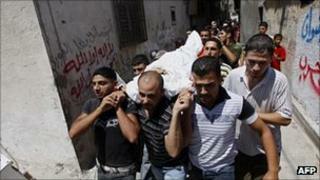 The militant Palestinian group, Islamic Jihad, has agreed a new ceasefire halting rocket attacks on Israel. The Hamas government in Gaza confirmed the deal, reportedly mediated by Egypt. It comes after a week of hostilities in which more than two dozen people have died, sparked by a series of attacks near the Israeli city of Eilat. This is the second truce in quick succession. The first was called by Hamas late on Sunday, but it failed to end the violence. After Israeli air strikes on Wednesday killed two leaders of Islamic Jihad in the southern city of Rafah and Gaza City, the group launched a volley of rockets and mortars at southern Israel. Two more of its militants were killed in an Israeli raid on Thursday night as they fired mortar shells at an Israeli border crossing. Palestinian medical sources say Israeli strikes in recent days also killed at least three civilians. In cities of southern Israel, rockets fired from Gaza sent residents running for cover. An Israeli baby was among those injured by shrapnel. The latest clashes began with a series of shooting attacks that killed eight Israelis close to the popular holiday resort of Eilat on Thursday of last week. Image caption Bomb shelters were placed near houses in Ofakim, southern Israel, as rockets were fired from Gaza. Israel blamed Palestinian militants from the Gaza Strip, crossing from Egypt. A total of 15 Palestinians were killed by Israeli military action before the first ceasefire was called. More than 100 missiles had been launched in the same period and one Israeli man in Beersheba was killed. Many more were injured on both sides. The Israeli government is not commenting officially on reports of the latest tacit ceasefire. Palestinian officials say that Hamas and Egypt will try to get all factions in Gaza to stick to the truce. Egypt has seen its own tensions rise with Israel after five of its security personnel in the Sinai were killed as the Israeli military pursued militants. It is under pressure to contain the situation in the Sinai and restore relative calm to its borders. In Cairo, protesters outside the Israeli embassy have been calling for the ambassador to be expelled. There are plans to hold a further demonstration on Friday.